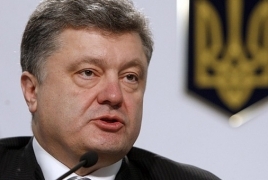 PanARMENIAN.Net - Ukrainian President Petro Poroshenko has appointed a new ambassador to Armenia, Ukrinform reports. A relevant decree has been posted on the president’s website. Diplomatic relations between the two countries were established on December 25, 1991. The Embassy of Armenia in Kiev opened in 1993 (Andranik Manukyan was appointed ambassador in April 2010). The Embassy of Ukraine in Yerevan opened in 1996 (Ivan Khukhta was appointed as ambassador in June 2010).